Shaker aforalpha sent me this arresting photo taken by photographer Kelly Bell during the protests against the Trump Regime's nativist agenda on June 30, 2018. I have been deeply moved by the women who have protested the abuse of immigrant babies with their own babies strapped to their bodies, e.g. Chrissy Teigen and Senator Tammy Duckworth. 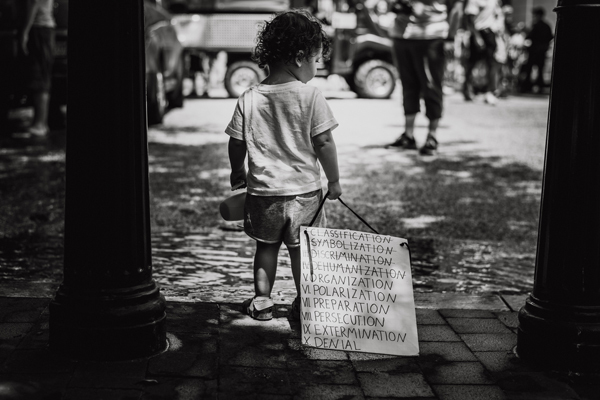 And this photo, of a toddler with a sippy cup in one hand and in the other a sign they cannot yet understand, but carries because they are being raised by people who want them to care about the fate of their peers without their privilege, has shattered my heart into a million pieces.